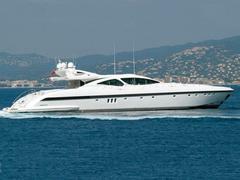 Yet another Mangusta comes on to the market as I'm told that Simon Ting at Blue Water has signed the 40m Celcascor_ _for sale - that makes 15 Mangustas listed on boatinternational.com. Celcascor was built in 2006 and her open top saloon has hardwood floors, luxurious sofas and a bar, while both aft and forward decks have wide, comfortable sunpads and outdoor lounge and dining areas. A further lower deck saloon offers space as a TV lounge. Four staterooms accommodate up to 10 guests and her twin 3645hp MTU engines power her to a cruising speed of 30 knots. Currently lying in the South of France, Celcascor_ _is asking €10.95 million.